In The Mystical I, Joel Goldsmith reveals in contemporary language that which Jesus showed to the world – that there is a human "I" and an "I" that is the Son of God. Jesus said "I can of myself do nothing," and that is the truth about our human I. But as the "I" that is the Son of God, the Master announced, "I am the way, the truth and the life." The Mystical I gives readers the fullness of this relevant and timely Christ message. Goldsmith shows us that this "Son of God I" is the I that "stands at the door and knocks" within each and every one of us awaiting recognition and acknowledgment. For ages this profound truth has been veiled, says Goldsmith, by worshiping the one who reveals the Word of God, instead of the I abiding within each of us. As a result, we have lost touch with this true I, and that is the reason for all of our problems. 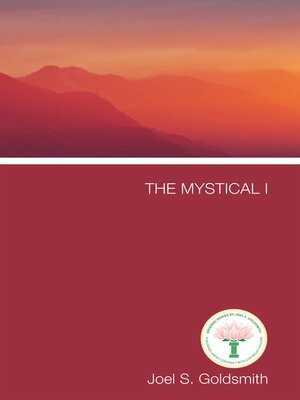 The Mystical I answers the age-old question of how to attain oneness with the I that we truly are, that which fulfills us. Goldsmith writes, "When you open the door of your consciousness and admit I, you will find the Presence – at first slowly and gradually, because none of us could take it all in one leap – but you will find that the Presence flows out from you in the forms necessary to your daily experience." Goldsmith gives encouragement to the reader to be receptive and listen for the "still, small voice" of God and to cherish it secretly in consciousness until it flows freely and fully. Then, he says, you will be able to hear, "I in the midst of you am God." The Mystical I is a wonderful gift that will be cherished by all who want to plumb the depths of spiritual consciousness.